The PDC Betfair World Cup of Darts is over and England successfully defended the World Cup of Darts. But the withdrawal of Team Philippines invited players, Christian Perez and Lourence Ilagan, continues to generate insinuations, innuendos, controversy, and disbelief from the fertile minds of our kababayans. 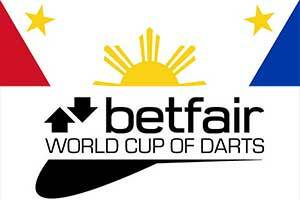 “ The Philippines team have withdrawn from the Betfair World Cup of Darts ….. The pair of Lourence Ilagan and Christian Perez have pulled out of the three-day £150,00 event due to travel problems”. Immediate reaction ranges from dart politics to lack of sponsorship, but has anyone really looked into the real facts of the case? January 16, 2013, I got a text from Jojo Claudio stating that an invitation was extended to Christian Perez and Lourence Ilagan to represent the Philippines in the World Cup of Darts scheduled for February 1-3, 2013 in Germany. I also got an email from Jojo regarding this invitation. Jojo Claudio is the PDC liaison of the PDC activities in the Philippines. I replied to Jojo that I will forward the email to Ian Perez for his information, preparation, availability, and conformity. I also checked if the procedures and time line for visa processing in the German Embassy is still the same as last year when Ian and Lourence represented the Philippine to the World Cup in Frankfurt, Germany. The time line for visa processing remains the same. There are 14 calendar days and 10 working days remaining until the start of the World Cup. It will take a couple of days to prepare the needed documentation such as the bank statements, my notarized sponsorship of all his expenses, forwarding of his pictures, preparation for his travel plans to Manila, etc. The appointment for interview will take 4 to 7 working days and the approval and release of the visa will take anywhere from 4 to 10 working days. The embassy staff will not guarantee any specific date of visa release. Even though there was “enough time” last year, the visas were released the day before departure. With the uncertainty of being granted a visa, it is a prudent and sensible decision to decline the invitation in order for another team to take the place of the Philippine Team. It would be totally unfair to the organizers to accept the invitation and suddenly not show up due to visa concerns and to deprive another team the chance to play. I informed Jojo Claudio that it is impossible for Christian Perez to get the visa on time with only two (2) weeks remaining before the start of the World Cup. Jojo replied that the invitation was sent by PDC on January 10, 2013, but he was in India at that time and only saw the invitation upon his return. I hope this puts to rest the lingering unfounded conspiracy theories on what actually happened. If questions persist and blame has to be made, I take full responsibility for the decision of Ian Perez.